This book features a selection of papers presented at the First IFIP WG 12.6 International Workshop on Artificial Intelligence for Knowledge Management, AI4KM 2012, held in Montpellier, France, in August 2012, in conjunction with the 20th European Conference on Artificial Intelligence, ECAI 2012. The 11 revised and extended papers were carefully reviewed and selected for inclusion in this volume. They present new research and innovative aspects in the field of knowledge management. 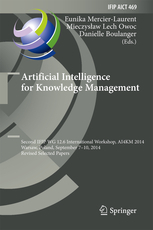 This book features a selection of papers presented at the Second IFIP WG 12.6 International Workshop on Artificial Intelligence for Knowledge Management, AI4KM 2014, held in Wroclaw, Poland, in September 2014, in the framework of the Federated Conferences on Computer Science and Information Systems, FedCSIS 2014. The 9 revised and extended papers and one invited paper were carefully reviewed and selected for inclusion in this volume. They present new research and innovative aspects in the field of knowledge management and are organized in the following topical sections: tools and methods for knowledge acquisition; models and functioning of knowledge management; techniques of artificial intelligence supporting knowlege management; and components of knowledge flow. How Should Digital Humanities Pioneers Manage Their Data Privacy Challenges?